Thirteen years later, he sets out to reach out to her when he can no longer resist the consuming thoughts of her that have haunted him for so long. However, the same demons that caused him to let go of her in the first place are still holding him back. But when he is thrust into a situation where he has no choice but to become professionally involved with her, a Pandora’s Box of angst, resentment, and passion is unleashed. Now they are forced to make the decision on how to proceed. But will it justify the one that they made in the past, or will it mock it? I received a copy from the author through a Goodreads group in exchange for an honest review. NOOO!!! That cliffhanger! Why the heck would you do that to me?! I need the next book right this second! 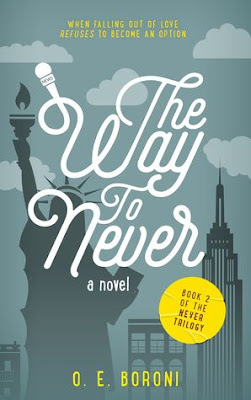 The Way to Never is way better than the first book, although the first book contained more story. It was really nice seeing how Nathan and Lenora's lives turned out to be. From being a loner who didn't let anyone in, Lenora now has a pack of friends that seem like her family. From being indecisive about what she wanted for her career, she now has two. Nathan, on the other hand, is now a successful reporter in CNN, just like he wanted! The Way to Never is a book that really surprised me. Normally, I hate books wherein the main character strings a guy along, when she clearly likes another, but for some unknown reason I didn't mind it that much in this book. Probably because Nathan was there first and I was already rooting for them since the first book. Also, the feels when both of them are in the same room didn't hurt either. My favorite character from this book has to be Nathan's dad. He's a charming old man, and I really hope to see him more in the third book. I'd love to hear his stories regarding Nathan's childhood and other embarrassing tales that he can share. This ended in a crazy cliffhanger, and I just need to get my hands on the next book or I might go crazy with anticipation. I'm already pulling my hair and screaming after reading that last sentence. I don't know how I'll handle waiting for the next book for so long!